Is what I worked on last night and this evening. I think my new storage is much better and I can quickly grab what I need. I used some very large folders that my friend Linda gave me. She gave me a whole box of the 14 inch long folders some months ago. I have also used these to make my Cricut cart boxes that I posted back in the fall, or maybe it was summer. I think I will like this system. The crates are easily obtained at Wal-Mart for like $1.25 so if I need more I can always get another crate. I decided to do them sideways so another crate can be stacked on top if needed. Remember you can click the pictures to make them bigger if you want to see more detail. Here is the crate I keep them in. I did cut extra folders for when I get new folders. 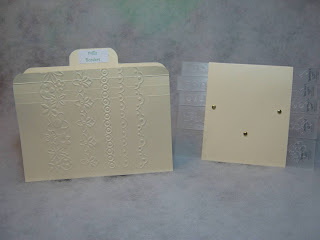 I made dividers for the folders and labeled them A2 Folders, Words, Holidays, 2x2 folders, Borders and Combo Sets. 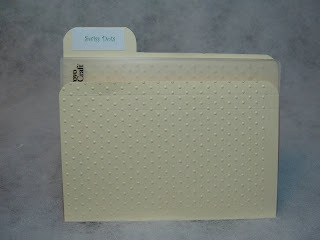 This is a picture of what the regular A2 folders look like. I decided to emboss the front so I could easily see what design the folder makes. As you can see some of the folders are shorter in the front and I figured what the heck, not really going to see it all the time anyway. I will likely end up inking the edges eventually and maybe even the design. This last picture shows the way I did the combo dies. I added sides to the folders to keep them from falling out of the little folder. I did emboss on the front to give me a rough idea. 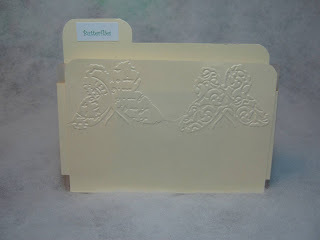 oo okie this is a great way to storage the cuttlebug folders. you gave me inspiration, i do have all my folders together in a box, lying flat, so I can't see what I do have. your Idea is great. fab idea, my collection is not large enough yet but once I start getting more and more I will have to do this. How creative you are! 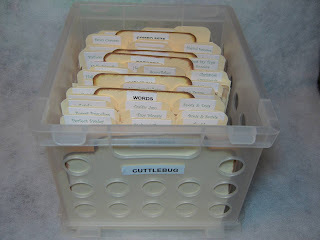 This is a wonderful way to keep them organized and at fingertip. You did an outstanding job! OK now I see. I am jealous of all the folders you have. they sell like 4 in the town I live in. I will be adding that to my shopping list when I go tot he states. I am so glad that I found your blog. This is such a great idea for storage. 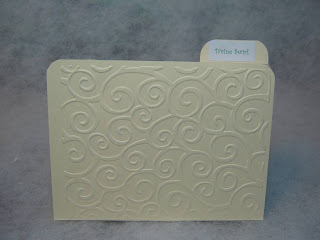 I love the idea that you emboss the folder you keep it in. I bought the expensive cuddlebug storage binder but was outraged at how expensive it is. I am going to sell it on ebay and switch to this. I just got DS today and this was the first cut file I used. THANK YOU!! I can't wait to try more. And thanks for helping me get organized. This is the sa-weetest idea. I hate having to sort through all my folders each time I want to use one! Thanks for sharing! I like this idea. Right now mine are in a three ring binder that has big plastic inserts I can stick them in. Two fit per page and I can see them well, but the more I get, I can see the binder not closing. Plus I have no idea where I got them ! 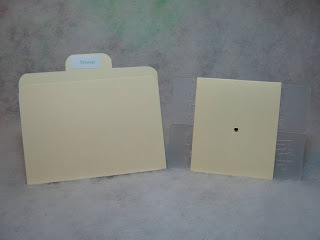 Can I ask what the dimensions are on the actual Manila folders that are FOR the embossing folders are? I really don't remember since I had made a file using Design Studio for them. I haven't cut any folders in quite sometime since I don't even use a cricut anymore.